We usually wait until May to take off the hardtop and the snow tires. However, when the temperature hit 70º a few weeks ago, we decided it was pretty safe to get the car ready for Spring. 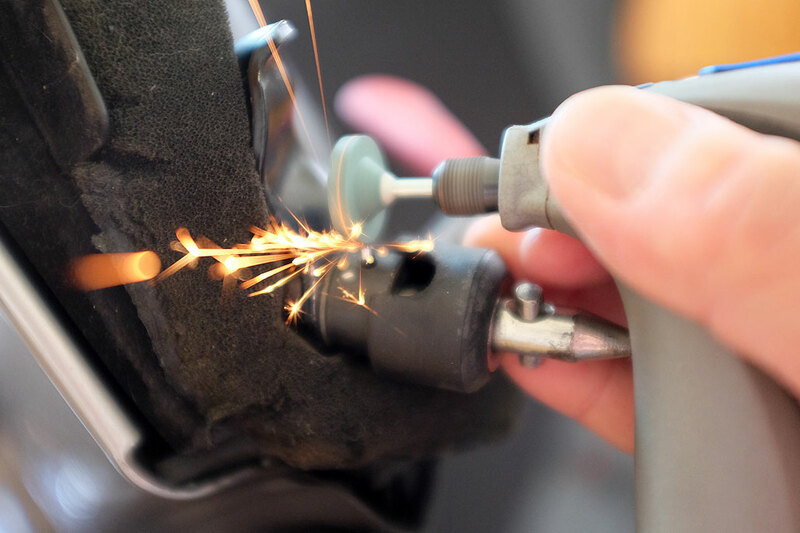 Spring Prep consisted of: a quick check of the pads and rotors; some lithium grease for the joints on the front end; and a vacuum of the interior. This was the second season on these WinterForce snow tires. The alignment done last season really made a difference as the tire wear was very even. 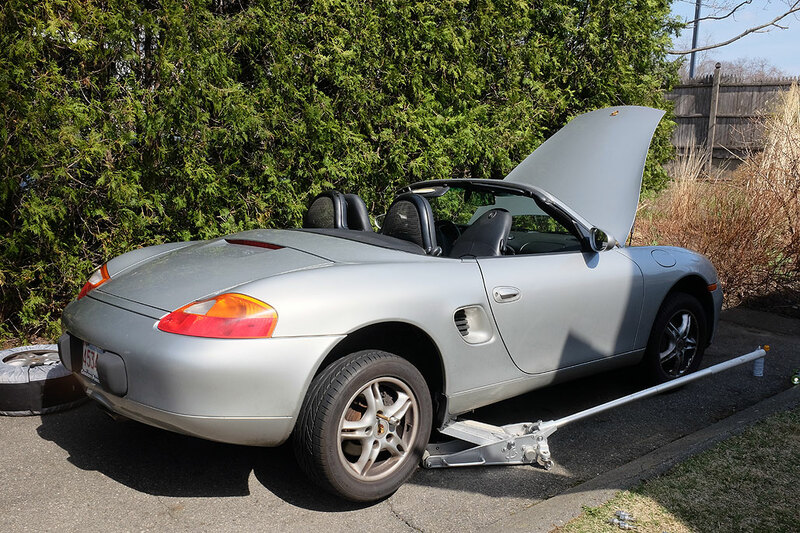 When removing the hardtop from Boxster, we ran into a slight problem: the release lever on the driver’s side moved, but the hardtop didn’t release. What we discovered was that the tech who last serviced the car had snapped the cotter pin (which connects the lever to the shaft) when he replaced the hardtop. We briefly considered making them fix it, but we didn’t want them to mess it up even further trying to get the top off. It took us a while to remove the top, but once we did, we were left wondering, how should we fix the lever? The normal solution would be to replace the cotter pin. The issue was we were unable to insert the pin…conceptually easy, but practically difficult. The bits shown in the top left photo below is the broken cotter pin. The shiny tube below the bits is the pin we could NOT jam into the lever no matter how hard we tried. The “problem” sat in the conference room for a few weeks before a solution bubbled to the surface. NOTE: The same work was done to both left and right levers. The images shown are from both sides depending on which was clearer. As a result, the lever orientation may not be consistent. Do not be confused by that. Our problem with inserting the cotter pin was that we could not keep everything simultaneously aligned AND tap in the pin, especially with all the curved surfaces. As it turned out, the ViseGrip was key to holding everything together and aligned as there is a tension washer between the bracket and the lever. The solution we came up with was to insert a hex key with the same approximate dimension as the hole (2.5mm). The next step was to cut off the excess. 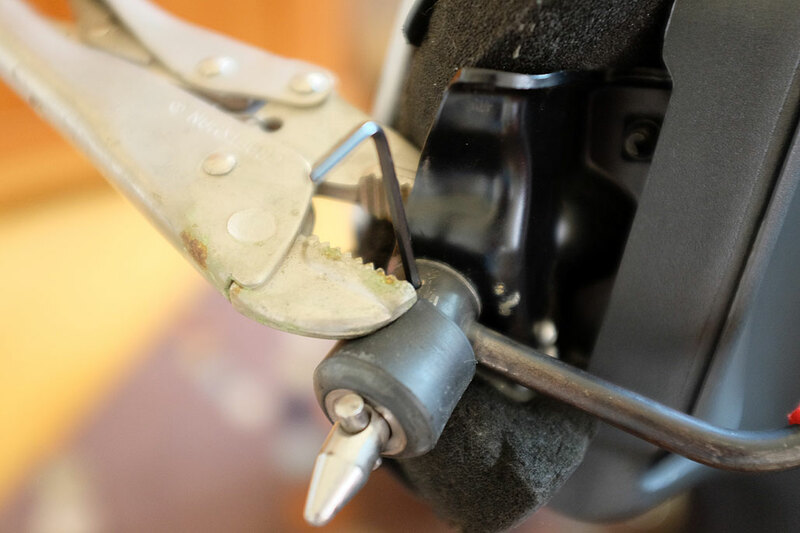 The best way to do that is with a Dremel rotary tool and a cutoff wheel. Sparks were flying (literally), so common sense and safety precautions were strictly observed. We cut about 3/4 of the way through and broke the bar off before it went flying. That left the end a bit ragged. 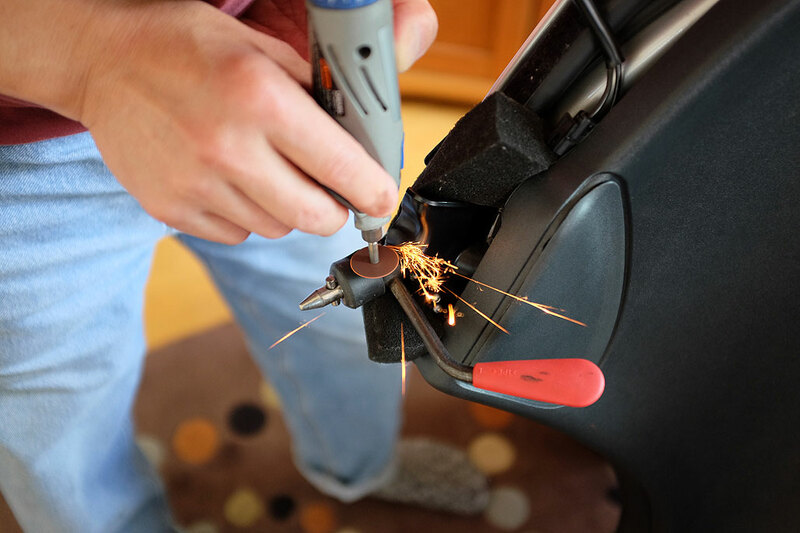 A quick touch-up with the Dremel and a grinding wheel bit took care of the problem. Some might want to try this fix using a drill bit instead of a hex key. We would recommend against that. The metal used for drill bits is very hard but brittle and WILL snap when stressed. How do we know? We had already given that a try 🙂 Good quality hex keys are made with metals designed to handle exactly the kind of shear forces in this situation, and will likely perform better than a steel cotter pin. We are hopeful that it will fix the problem once and for all. 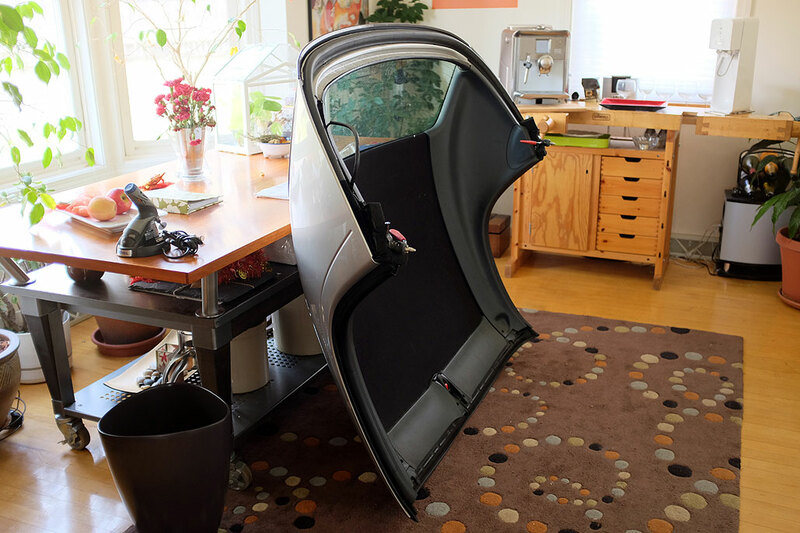 NOTE: Some readers have asked how best to store the hardtop when it is off the Boxster. There are two ways: hang it, rack it. We chose to hang it on the wall as it was out of the way. The downside with this option is it takes two people to do it. 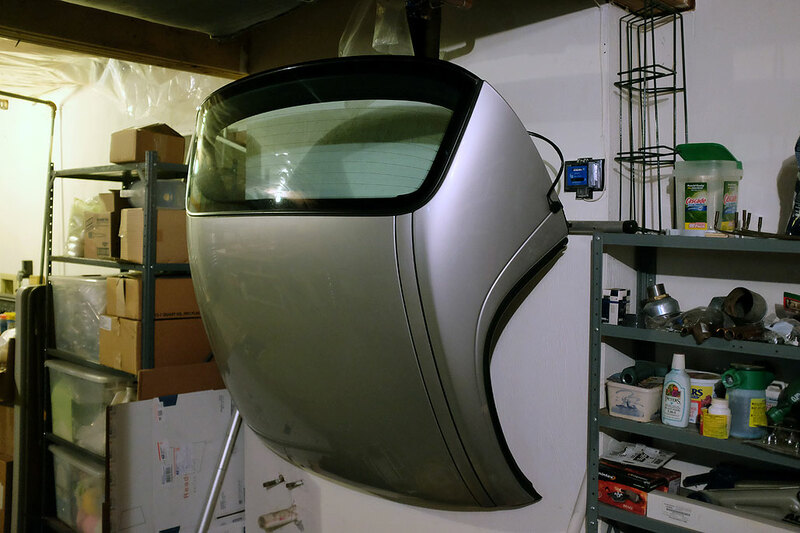 Those with a garage and looking for a one-person solution may want to consider using a hoist.